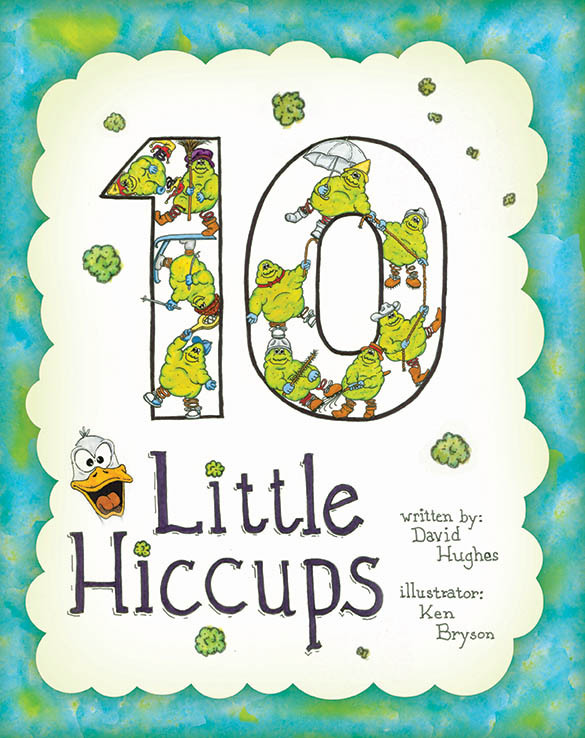 10 Little Hiccups is Now Available! It’s hard to believe it’s been 18 months since I wrote my second illustrated children’s book, 10 Little Hiccups / 10 pequeños hipos, but it’s with great pleasure that I get to announce its official release by Progressive Rising Phoenix Press. On September 15th, this pre-school counting book became available for purchase. Written in both English and Spanish, 10 Little Hiccups / 10 pequeños hipos features a young lady caught up in a bout of persistent hiccups. As the fluffy green hiccups rise up from her toes and tickle her nose, she tries everything she can to get rid of them, but only when her daddy yells “Boo!” do the hiccups finally take a hike and wind up terrorizing a duck. 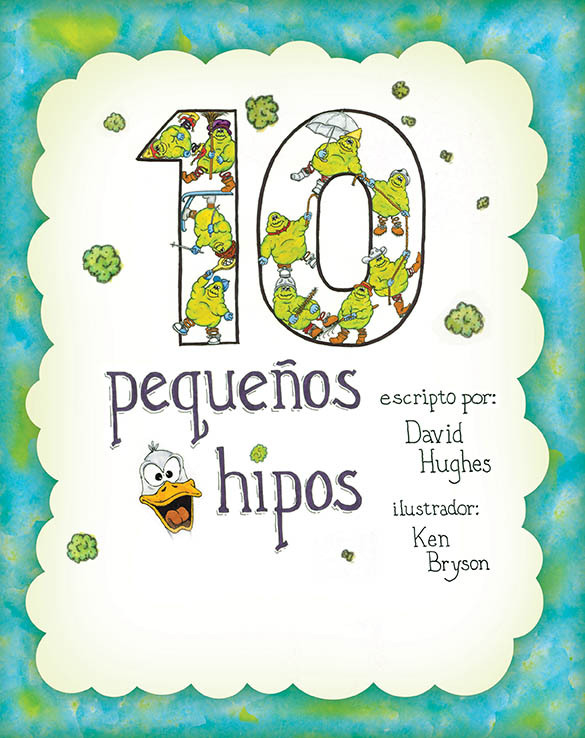 10 Little Hiccups / 10 pequeños hipos is beautifully illustrated by my neighbor and friend, Ken Bryson. When I first came up with the story I asked my daughter, Hannah (who was six at the time), to draw a hiccup for me because I had no idea what one looked like. 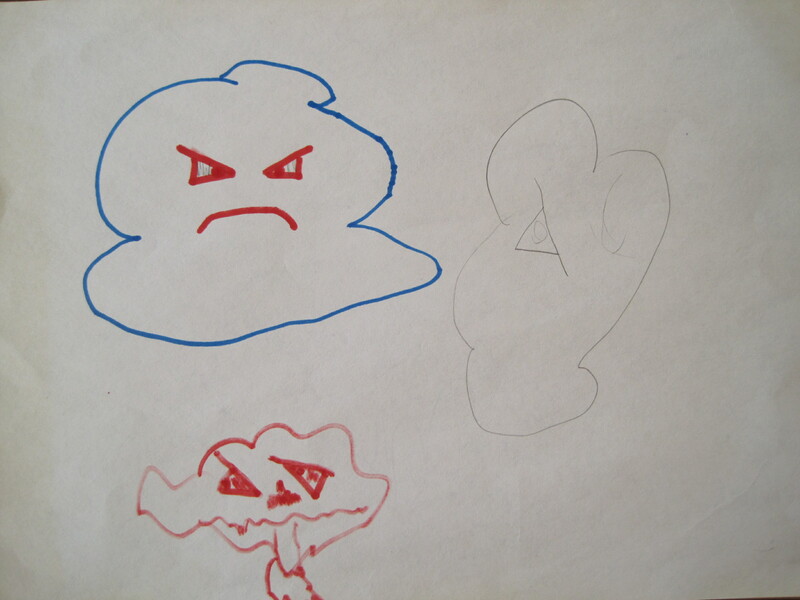 She took her assignment seriously and carefully drew a prototype. 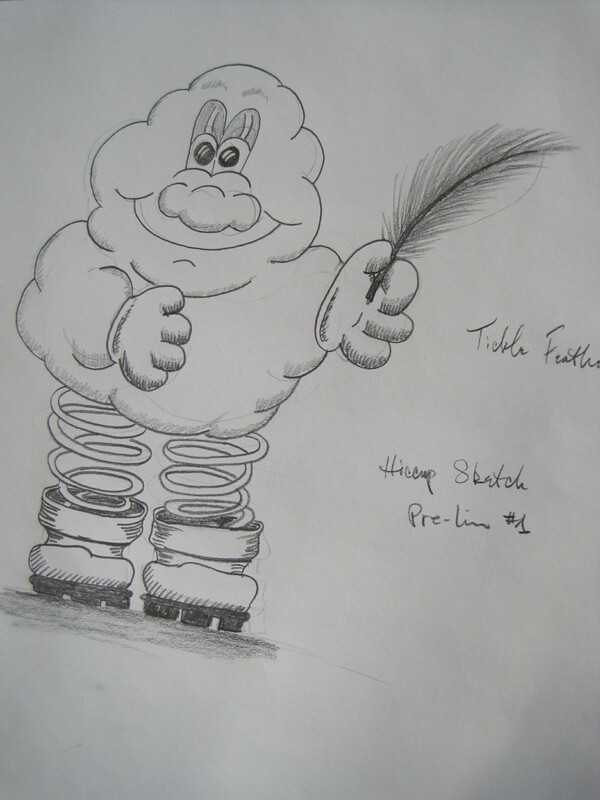 Ken then used Hannah’s original drawing to develop his cast of gaseous characters. I’m still amazed he took the time to flesh out not only the girl and her dad, but ten unique hiccups with individual personalities to romp on the pages. And I LOVE the duck! I appreciate the hard work and time Ken put into this little book, especially because he had to take some time off during its development to recover from a heart attack! He’s doing great now, and looks forward to joining me at the upcoming book signings. I’d also like to personally thank Dr. David A. Bedford, Spanish professor and author of the Angela series of books, for translating the original text from English to Spanish. Not only did he revise the manuscript to match the rhyme and cadence, he also tweaked it to read more naturally for native Spanish speakers, something I could not have done on my own. And special thanks goes out to Arlene Gale, author of the award-winning book, Face Forward, Move Forward, for translating the more mundane parts of the text (copyright page, dedications, etc.). I’m honored to have such giving friends, and I hope I can repay the kindness in the future. 10 Little Hiccups / 10 pequeños hipos is available at www.barnesandnoble.com, www.amazon.com, www.progressiverisingphoenix.com, and at select stores and online retail stores. For those of you in the Dallas-Fort Worth area, both Ken and I will be at the Words & Wood Festival, a music and book signing event on Saturday, September 19th, from 4 PM to 8 PM, at Espiritu Wine Bar, 6142 Frisco Square Blvd, Frisco, Texas. Please come out and enjoy live music, drink some wine, and meet more than a dozen authors and songwriters. And whether or not I see you at one of our future book signings, I’d love to hear from you! Please let me know how you liked (or didn’t like) the book—any and all feedback, good, bad, or ugly, helps me to improve. Just a little FYI on my other projects: The Dark Side of the Covers, a middle-grade reader containing twelve Twilight Zone type short stories for kids, is in final rewrite/edit. And the illustrator, Christina Evans, is hard at work developing the cover as well as the chapter artwork. I’ve enjoyed putting this book together, and I can’t wait to share it with the world. In addition to The Dark Side of the Covers, I’m also planning to send my next inspirational book, A Matter of Perspective, and a fun Twilight Zone type novel, On the Inside, to the publisher in 2016 as well. This writing life is keeping me busy, busy, busy! But I wouldn’t have it any other way. For author/illustrator interviews contact me directly, or get in touch with my publisher, Progressive Rising Phoenix Press: contact@progressiverisingphoenix.com or http://www.progressiverisingphoenix.com. Twitter: @PRPpress. Facebook: https://www.facebook.com/RisingPhoenixPress.